What can we learn from Europe's experiences with shared streets? In my last post, I took a look at streets that have been designed specifically so kids and cars can safely share space. That’s most definitely not the case on streets like this one, where a seven-year-old Seattle girl last week was critically injured by a car that hit her in a crosswalk, never even braked, and left her lying in the street. A bold experiment in Portland last week offered a glimpse of how different things could be. Using a DIY approach that would make a traffic engineer wince, Better Block PDX temporarily transformed several blocks of 3rd Avenue in Old Town/Chinatown from a street that primarily moves people in cars to one that serves all kinds of people. The difference between a street that’s relatively safe for pedestrians and one that’s potentially lethal hinges, in large part, on how fast cars are driving. So if we truly want to make Northwest streets safer for kids, there’s not much mystery about how to do it. As the chart below illustrates, a pedestrian has an 85 percent chance of being seriously injured or killed after being hit by a car traveling 40 miles per hour. Those odds drop to 45 percent if the car is traveling 30 mph. At 20 mph, there’s a much smaller 5 percent chance of serious injury. Another study from the United Kingdom found that lowering speed limits to 20 mph caused collisions between cars and kids to plummet by 67 percent. The good news is that Northwest cities have more power and flexibility than ever to lower speed limits on residential streets. We’ve also spent decades building traffic circles, installing speed humps, and painting giant ladybugs at intersections, all in the service of getting drivers to slow their cars through residential neighborhoods and intersections.The region is also beginning to experiment with “shared use streets,” which feel somewhat radical here but are old hat in developing countries and European cities. To recap—because this really goes against everything your parents probably taught you—this concept describes places where people, bicycles, kids at play, people eating dinner, barbecuers, dog walkers, and gardeners share the roadway with cars. The absolutely essential ingredient in this arrangement, though, is that the cars must travel slowly enough that they don’t endanger all the other users. On commercial shared use streets, it can be crowds, chaos, and a lack of signs and signals telling people where to walk or whose turn it is. Some Northwest cities are beginning to experiment with some elements of shared use streets. Here, for instance, is one idea for transforming the junction of E Union Street and University Street on Seattle’s First Hill to a more people- and bicycle-friendly right of way. So it seems like a good time to ask what we can learn from Europe’s decades-old experiments with shared use streets, how safe they are, and the evolution of thinking there about costs and benefits. More than four decades ago, The Netherlands began looking for ways to reduce the negative impacts of traffic on social life—and specifically on curtailing kids’ play. Their solution was the woonerf (pronounced vone-erf; plural “woonerven”), a low-traffic street that’s built with no separation between the road and sidewalk. Carefully engineered traffic calming tools—landscaping, tables in the right of way, play houses, narrowing pinch points, textured surfaces, flower planters, meanders, designated entrances and exits—signal that cars are “guests” in the space. Early studies found that vehicle speeds in woonerven dropped to between 8 and 15 mph, and injury accidents were reduced by 50 percent, according to a compendium of case studies from the US Federal Highway Administration. Even more than traffic and safety improvements, Dutch residents appreciated the overall neighborhood benefits and expanded play areas for children. They’ve been so popular that more than 7,000 have been built across the country. Those livability benefits, more than concerns about traffic injuries, prompted the UK to begin experimenting with “home zones” about 15 years ago. In those areas, residential streets were built or retrofitted with gateway features, 20 mph speed limits, humps and chicanes, shared surfaces, community areas, public art, upgraded lighting, playgrounds, vehicle parking, and other features. An analysis of early projects found significant reductions in traffic speeds, as well as other benefits like falling crime rates and rising home prices. In one example, 82 percent of residents said more children were playing in the streets and meeting new friends after the home zone treatment. However, concerns about kids in the road and reduced parking still continued to cause some tension in the community. The downside of wholesale street retrofits is that they are expensive, and not every street has low enough traffic volumes to be a good candidate for a full-blown woonerf treatment. That led some European cities to question whether they could get some of the same benefits by using a cheaper suite of traffic calming methods across wider swaths of the city. That thinking led to 30 kph zones (about 19 mph), which employ some of the same strategies like speed humps, roadway narrowing, street surfacing, and parking management. But typically cities use them less intensively across broader areas. Germany, for instance, saw traffic fatalities fall by 50 percent in its “Tempo 30” zones. Berlin saw a 66 percent reduction in collisions involving children, and street activity increased by 60 percent in those slower traffic zones. More recently, the concept has spread to the United States. Three years ago, New York City began designating “Neighborhood Slow Zones” where speed limits are reduced to 20 mph. Relatively inexpensive treatments like entrance signs, large stencils painted on the street, and speed humps alert drivers. So far in those areas, the city has seen a 10-15 percent decrease in speeds and a 14 percent reduction in crashes with injuries. Another evolution in shared use streets came from Hans Monderman, whom Wired Magazine famously called “a traffic engineer who hates traffic signals.” Thirty years ago he worked in a small Dutch town that was too cash-poor to pay for traffic calming. So he experimented by removing the traffic signs and street furniture to create a flat, open space where cars, bicycles, and pedestrians had to sort out the rules of the road. To his surprise, vehicle speeds declined by 40 percent. There’s evidence that traffic speeds and collisions drop in shared spaces, and that removing traffic signals at intersections can improve travel times (even though everyone’s driving more slowly, no one’s getting stuck at a standstill). However, pedestrians and cyclists have reported feeling less safe in shared spaces, along with blind, deaf, and other road users with disabilities. Ironically, that discomfort is precisely what forces people to slow down and pay attention in the first place. The short answer is yes. Here’s Seattle’s Bell Street Park, which got rid of curbs and sidewalks on four blocks of that major downtown street. It uses planters, street furniture, non-traditional paving, and other elements to signal that that the space is being used by people not in cars too. There are plans to transform this weedy lot on the corner of 12th Avenue and E James Court across from Seattle University into a neighborhood park and adjacent woonerf. Both of those projects are spearheaded by the city parks department, which has the budget and mission to create people-friendly, liveable spaces in park-deficient urban areas. Another opportunity lies in areas of the Northwest that are redeveloping. into an area with narrower car lanes, wide sidewalks, tons of street furniture, less vehicle parking, more bike parking, and pedestrian crossings that forgo curbs and proscriptive crosswalks in favor of uniform brick pavers. Plans for 8th Avenue North, which the city of Seattle has designated as a residential corridor for the South Lake Union neighborhood, call for a full-blown traditional woonerf/shared street treatment. Obviously, it’s important to ask reasonable questions when considering shared streets. Do big trucks or buses use the corridor? Are there more cost-effective treatments if you’re trying to slow traffic throughout a neighborhood? 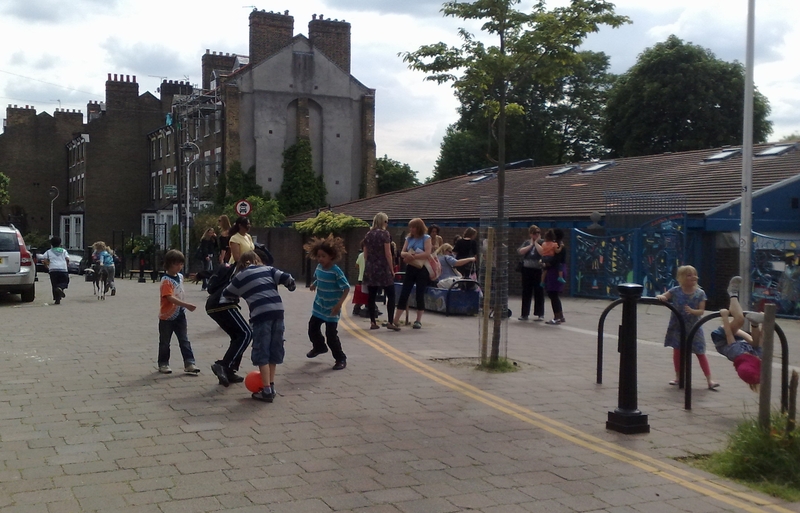 Is creating urban places for kids to play and neighbors to socialize an important goal? What’s the comfort level among elderly or disabled residents? Are there elements you can borrow appropriately? But Europe has shown that shared use streets can work, safely and in huge numbers. They reduce traffic speeds, add value to neighborhoods, reduce injuries, and offer needed urban pockets for kids to play kickball, hopscotch, or house. It only makes sense that we could see some of the same benefits here, if we make smart and informed decisions about where to try. Nice job on this story, Jennifer. Pike Place works like one when there are lots of people walking. The Green Streets program includes elements of these, too. Thanks, Don – I wasn’t aware of the Cloverdale shared street. Will be cool to see how it turns out. Thanks to Susan Balbas for supporting a sustainable Northwest.